This post is about the wonderful experience I had with the Cognizant family in the first edition of “XPERIENCE COGNIZANT”. I wish each one of you experience the same! The Cognizant Campus Ambassadors from the select 60 colleges from all over India were invited to participate in the 3-day conclave ‘Xperience Cognizant’. We were around 92 students in total. The purpose of this conclave was to create awareness among the student body about the work ethics of Cognizant and the future of technology as envisioned by Cognizant Technology Solutions. Lets call it a platform provided for the ambassadors to meet and interact with the senior level management at Cognizant and get to know how things work there. It was fantastic to meet the best minds from far corners of India pooled into a single place. We were excited to know what Cognizant had for us for the next three days. Here is a brief note on the 3-day festival. Satish Jeyaraman who heads Talent Acquisition Team of Human Resource Department gave a presentation on Volatility in the technological world. He was a silent and humble person with versatile knowledge on the corporate world. He explained how Cognizant survived the legendary “Recession” disease. This was followed by a group activity where the ambassadors had to do role-play and collage art work on the topic related to placements. The creativity and acting skills of the students baffled me! There was another session at SIPCOT in Chennai by Ramachandran ,the Head of India for Campus Training Operations, about the training process that takes place at Cognizant. I must say that Cognizant is a mini-college. State-of-the-art technology with brilliant faculty. What else do you need for learning? Btw, it was the end of day. We went back to our rooms in the exquisite FORTUNE hotel standing elegant on the OMR road, Chennai. Owing to the continuous traveling that day, I slept like a baby as soon as I entered the room. The ex-CEO of Cognizant Mr. Lakshmi Narayanan gave a short presentation and answered all the questions posed to him. I wanted to take a video of his talk. But sticking out my phone amidst such a refined set of audience would make me look dumb #PatheticMe :-P. Then, Raj Bala, Chief Technology Officer of Cognizant took a session on upcoming trends in IT. He also explained about all the research initiatives that Cognizant was pioneering. I was really interested on Cognizant’s work on Cloud Computing and Mobile technologies. Until then I was thinking Cognizant was all about C#, .NET and Java. But I was completely wrong. Their scope is far far beyond what I had initially surmised. Then suddenly we had a quiz competition rolling in! They called it ‘AWE’ General Quiz. Each college forms a team. Nandhitha and I cracked the prelims and won Second Prize in the finals. Then there was a premilinary round on Technical quiz wherein we had questions on C and C++. Being a Computer Science student, I found it really simple and finished it off soon. 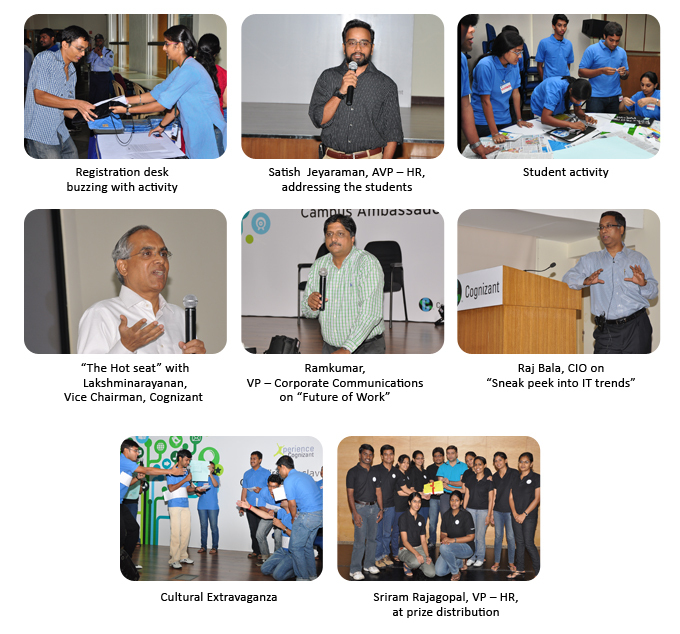 This was followed with an evening of cultural activities where the employees of Cognizant performed. I even saw few of my college seniors there. The Day-2 night is unforgettable. Each and every incident which happened then is still so vivid in my head. Now before you jump into conclusions, let me say that your guess is wrong (Bad bad mind, no doughnuts for you! :P) That night, all the Tamil speaking people stayed up in a single room and we were chatting till 3 or 4 in the night (I don’t remember the time. But it was late). We had this “Truth or Dare” game and then some beautiful love stories getting revealed. It was nice meeting new people. The day began with the Prize distribution ceremony. You have no idea how many prizes Nandhitha and I grabbed then! 😀 Let me list them. SSN College emerged as the overall winners and we Campus Ambassadors won Acer Laptops and the title “Grand Brand Ambassadors”. And after that there was no talks, no quizzes or no Cognizantism. It was a special screening of the movie ‘Final Destination 5’ arranged at Mayajaal! It was awesome. And here is the interesting part! Cognizant is collecting nominations for the next version of “Xperience Cognizant”. Contact your college placement cell for more information. All the best guys! Don’t miss it..